In the historic heart of Winterthur, the Gewerbemuseum mounts exhibitions which explore the points at which design, art and everyday life intersect. The museum shows the familiar in unfamiliar ways, asks pertinent questions, provides startling, multisensory insights into current topics and phenomena of the time, and offers easy access to the world of materials. In recent years, temporary exhibitions such as "Bike | Design | City", "Tattoo", "Böse Dinge – Positionen des (Un)geschmacks", "wood loop – auf biegen und brechen", "Oh, Plastiksack! ", "Plot in Plastilin" and "Der entfesselte Raum" have enabled the Gewerbemuseum to establish itself as a key player in the Swiss museum landscape and attract a wide audience. At the same time, the Gewerbemuseum’s permanent MATERIAL ARCHIV exhibition offers interested members of the public, professional experts, students at vocational colleges and universities, as well as school pupils of all ages an interactive laboratory for studying materials. Our moderate annual subscriptions, which are on a sliding scale, mean that you are already making a small donation while benefiting throughout the year from free entry to all exhibitions and events, invitations to exclusive special functions followed by drinks, and an opportunity to buy catalogues and exhibition posters at a discounted price. Our lively group of Friends makes a valuable contribution to the diversity and quality of our activities – do please join us! Individuals, institutions and companies can also become patrons. Subscriptions start from CHF 500 (individual) and CHF 2000 (corporate) and entitle you to the above benefits plus many other advantages, such as your name appearing on the patrons’ plaque and in the annual report, the use of the museum for your own functions, and free tickets for employees and clients. Our lively group of Friends and Patrons makes a valuable contribution to the diversity and quality of our activities – do please join us! Managers Valérie Schindler Palden and Phuntsok Palden Schindler offer guests freshly prepared vegetarian dishes using local ingredients, with a full menu at lunchtime, as well as mezze, soups, salads and light snacks throughout the day. A varied selection of delicious home-made cakes is also on offer. The leafy courtyard is an inviting spot to relax in during the summer months. A lavish brunch is served in the Grand Café du Musée from 10 a.m. to noon on Saturdays and Sundays. Linger over a tasty selection of menu items ranging from traditional Swiss to exotic Indian dishes, with a choice of portion sizes to suit smaller or larger appetites. 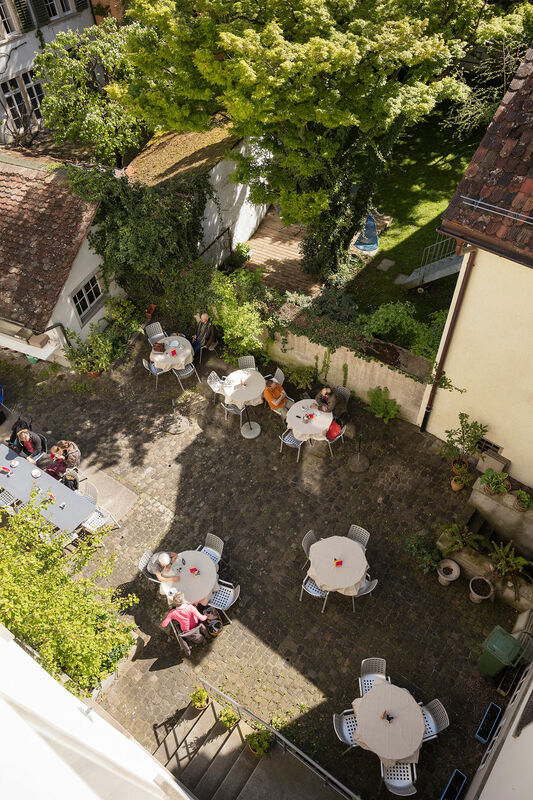 The Grand Café du Musée is open to everyone – no entrance ticket to the museum required. Tuesday to Sunday, 10 a.m. – 5 p.m. Please visit the website of the Grand Café du Musée for the seasonal menu and dishes of the day. The museum shop sells (almost) all the exhibition posters produced by the Gewerbemuseum since 1999, plus a large selection of postcards for every occasion. Our shop also offers a wide range of publications, which is constantly being updated to cover the current exhibitions. In addition, it stocks all kinds of gadgets, designer pieces and hand-crafted items that make excellent gifts or mementos. Feel free to browse at your leisure!